Our guest this week is Bill Wittliff. He’ll be talking with us about his new novel, THE DEVIL’S SINKHOLE (University of Texas Press, October 2016). Writing on the Air is broadcast Wednesdays from 6-7 pm Central from the KOOP radio studios in Austin, Texas. To listen, click HERE, or head to TuneIn. In Austin, you can hear us on the radio at 91.7FM KOOP. Check out our previous episodes below. The audios are on each page, plus our podcast is on iTunes. For show updates, look us up on Facebook and Twitter. Bill Wittliff is an author, producer, director, photographer and award-winning screenwriter. His new novel, The Devil’s Sinkhole, is soon to be released by the University of Texas Press. Bill’s many screenwriting credits include Lonesome Dove, The Perfect Storm, The Black Stallion, Legends of the Fall and Raggedy Man. In addition to writing the screenplay for the film, Red Headed Stranger, Bill also directed and co-produced. 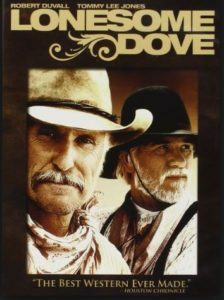 For his Lonesome Dove screenplay, Bill won a Writers Guild of America Award and a Bronze Wrangler award from the National Cowboy & Western Heritage Museum. He won another Bronze Wrangler for Legends of the Fall. 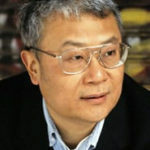 He has also received the Distinguished Screenwriter Award by the Austin Film Festival, and the Texas Medal of Arts Award. Bill is a graduate of The University of Texas. 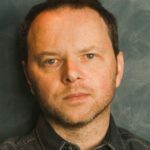 He is a member of the Academy of Motion Picture Arts & Sciences, a past board member of the Sundance Institute, a board member of the Austin Film Festival, and a member of the Texas Philosophical Society. 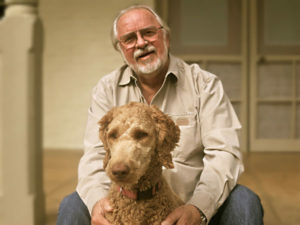 He is also a past president and Fellow of the Texas Institute of Letters. Bill’s fine art photography has been published in the books A Book of Photographs from Lonesome Dove, La Vida Brinca, and Vaquero: Genesis of the Texas Cowboy. He and his wife, attorney Sally Wittliff founded the highly-regarded Encino Press, as well as the Southwest Writers Collection at Texas State University, and have been awarded honorary Doctor of Letters degrees by the university. Now renamed the Wittliff Collections, the collection has grown to be one of the most extensive archives of Southwestern materials in the country. The Wittliffs live and work in Austin, Texas and have two grown children and four grandchildren. In this engrossing sequel to The Devil’s Backbone (University of Texas Press, 2014), the young man Papa and his cowboy amigo Calley Pearsall confront a legendary killer with a thirst for revenge and a psychopathic boy as the two friends search for the beautiful captive Pela Rosa. When last we saw the boy Papa in The Devil’s Backbone, he had finally learned the fate of his missing Momma and his vicious daddy, Old Karl. But hardly has he concluded that quest before another one is upon him. Now a white-haired man with a hangman’s noose around his neck and death in his eye—o’Pelo Blanco—is coming. And he means to hang Papa. 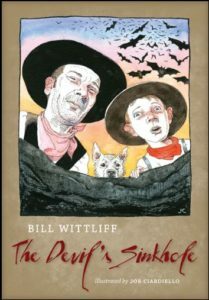 In The Devil’s Sinkhole, the master storyteller Bill Wittliff takes us on another enthralling journey through wild and woolly Central Texas in the 1880s. 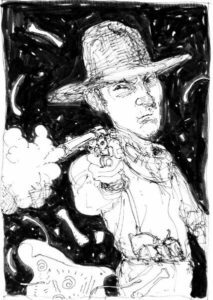 When Papa and his o’amigo Calley Pearsall confront Pelo Blanco before he can ambush Papa, the encounter sets them on a pursuit with a promise of true love at the end, if only they can stay alive long enough for Calley to win the beautiful Pela Rosa, the captive/companion of Pelo Blanco. But before they can even hope to be united with Pela and Annie Oster, Papa’s plucky sweetheart, Papa and Calley have to defeat not only Pelo Blanco but also the evil, murdering Arlon Clavic and deliver Little Missey, the mysterious Wild Woman a’the Navidad, to the safe haven of the Choat farm. With dangers and emergencies around every bend, it’s a rough ride to the Devil’s Sinkhole, where this world and the next come together, bringing Papa and Calley, Pelo Blanco and Arlon to a climax that will leave readers clamoring for the next adventure. 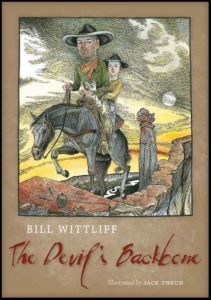 Wittliff grew up listening to stories and memories like these in his own family, and in this imaginative novel, they come to vivid life, creating an engrossing story that brims with folk wisdom and sly humor. Joe Ciardiello is an artist/illustrator. He is a graduate of the H.S. of Art & Design and earned his BFA from Parsons School of Design and the New School. Ciardiello illustrated Elmore Leonard’s 10 Rules of Writing, and his portraits of authors have appeared in the New York Times Book Review. 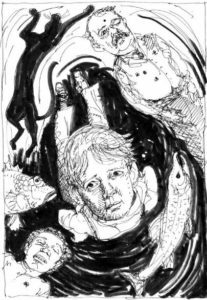 Among his awards are four silver medals from the Society of Illustrators.